With this article, we’re going to talk about the most important aspects of the PDF 2.0, also known as ISO 32000-2:2017. It was released in 2017, which is almost ten years since the first standardised version PDF 1.7 or ISO 32000-1. 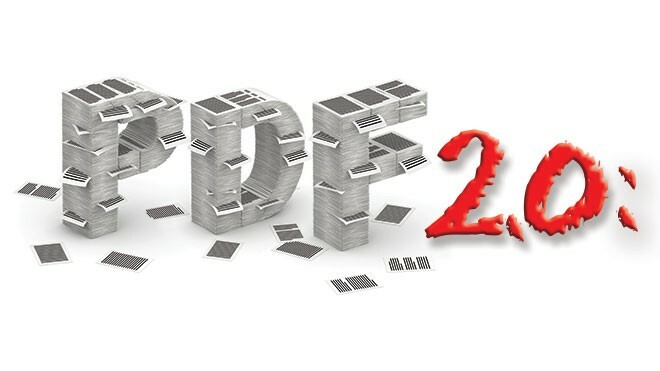 The enhanced features of PDF 2.0 aren’t completely new as they existed in other versions. Most ideas have been taken from well-known versions to combine everything in one sophisticated standard. Of course, there are some new ideas that we’re going to reveal further. As we’ve said, some of the features have been incorporated from existing versions in the past. You can attack 2D and 3D geospatial data to a page. This data establishes a certain relationship between the geographic region and the page’s information. PDF 2.0 supports 3D artwork in PRC format, which was important for designers. Moreover, you can add your portfolio into a PDF collection. Each collection is hierarchically sorted and there’s a set of predefined navigators available. Of course, the developers have taken security in mind by extending the AES encryption to support Unicode passwords and 256-bit keys. The Acrobat 9 algorithm had certain security flaws that were terminated with the enhancement of the AES encryption. It supports AES-256 to ensure the security of your files. The PAdES standards have been implemented and they include improvements in the digital signature. These two standards add extra protection against certificate substitutions. Moreover, they support Document Security Store (DSS), which allows you to attach validation material and time-stamps to a signed document. We have digital signatures for years now, but they were limited to the RSA and DSA signature schemes. The XI introduced support for signatures created according to the Elliptic Curve Cryptography. It also serves for public key encryption or certificate security as many refer to it. Now, the PDF 2.0 has only AES-256 encryption, while others have been deleted. As expected, PDF 2.0 comes with some new and handy enhancements. The tags of the PDF files are the structure of the file. To structure we refer to the specific set of instructions used to bind the content logically together. This includes proper reading order, lists, tables, figures and etc. The tags define the structure and most of them are automatically generated by Acrobat, but you can do it manually for improved results. There are new structure element types for parts of a document. Aside refers to sidebars, while Ref is for references. An element called Artifact allows irrelevant information to be stored in the structure tree. These are only a short list of the changes with Tagged PDF, while others you’ll see while using the software. And this is just a small drop in the ocean of new features presented by Adobe. Of course, we can’t reveal all surprises, so we’ve left some for you to discover! Head to SodaPDF to learn more about the latest ISO standards and more about the PDF 2.0.